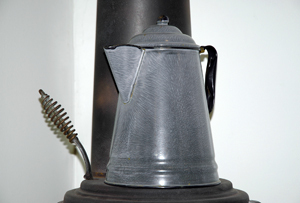 Stovetop KETTLES, STEAMERS & TRIVETS help add humidity into the air, and look great on top of wood stoves. Add potpourri, cinnamon sticks, cloves, orange peel or other favorites for an extra homey scent. Be sure and use a trivet beneath your kettle or steamer to help prevent boilovers and thus helping to prevent your stove from rusting. If you plan to make coffee, tea or other beverages that will be consumed then choose a kettle with a porcelain enamel interior. Click any item for size, colors & complete order details.